The extent of Arctic sea ice in March hit a record low for the month in the satellite era, according to the latest update from the National Snow and Ice Data Center. Back on February 25, a record low winter ice extent was set. The satellite image above, acquired on April 3, shows dark open water in the Fram Strait between Svalbard and Greenland. At this time of year there is typically more sea ice here. As for those lovely cloud formations, they’re called cloud streets, and they tend to form parallel to the direction of the winds. Click on the thumbnail at left to see how the evolution of Arctic sea ice extent this year compares to what happened in 2012, when a record low minimum extent was reached. So far, 2015 is well below that year. But that doesn’t mean that a new record low minimum extent will be set this year. We’ll have to wait and see. In fact, after Arctic sea ice began shrinking on Feb. 25 — considerably earlier than normal — it experienced a renewed period of growth for awhile during March, largely in the Bering Sea, Davis Strait and around Labrador. But that was not enough to offset the large-scale losses that had already occurred. The culprit has been an unusual pattern of atmospheric circulation during the winter of 2014/2015 that allowed unusually warm air to spill across northern Eurasia, the Bering Sea and Sea of Okhotsk, as well as Alaska and into the western part of the United States. Meanwhile, the same pattern was responsible for the brutal winter conditions that battered the eastern half of the United States this winter. The warmth in the West has had a withering effect on snowpack in the Western United States, as the following map shows. The map shows the rank of snow water equivalent measured on April 1 at sites across the western United States. All those black dots are indicative of record low snowpack. April 1 is typically about the time that snowpack in the mountains of the West peaks. As the map makes clear, this year, there was not much of a peak. This could turn out to be a very interesting year — and I don’t mean that in a good way. After sputtering and stuttering, El Niño finally has taken hold, and appears to be strengthening. If that continues, it could help to make 2015 quite warm, possibly the warmest on record. It might also help bring desperately needed moisture to California next winter, although that is a long way off and much can happen between now and then. NOAA’s Climate Prediction Center should release it’s monthly update on El Niño in the next day or so. But already we know that above average sea surface temperatures have expanded into the eastern Pacific Ocean in the tropics during recent weeks — a hallmark of El Niño. Time to fasten our seat belts: Possible weather and climatic turbulence ahead. Citation? It actually wouldn’t surprise me if thickness increased when extent increased during the latter half of the month, but the extent didn’t reach the earlier maximum, and as such I doubt the thickness did, either. He doesn’t care about that. Volume over quality is the typical MO, with a liberally sprinkling of inane cartoons funny only to climate change deniers. He’s apparently got a lot of time on his hands. Do you know what the difference between thickness and volume is? Hint: thickness is measured in meters whereas volume is measured in cubic meters. Do you know what PIOMAS stands for? Hint: “M” stands for “model”. When it was stated that this year’s annual sea ice extent maximum is a record low, this was based on measurements. The numbers in those charts? They are coming from a model and currently we do not know how well the model is reflecting what is happening to the ice. But lets take the PIOMAS data at face value for the moment. Do you know what the difference between the light grey and the dark grey shading means? Hint: assuming a normal distribution, 32% of the time you should be outside of the dark grey and 5% of the time you should be outside of the light grey. The chart shows us as being just barely outside of the dark grey. The fact that we broke the record for lowest annual sea ice extent maxima and record for earliest sea ice extent maxima speaks to the current state of the ice. 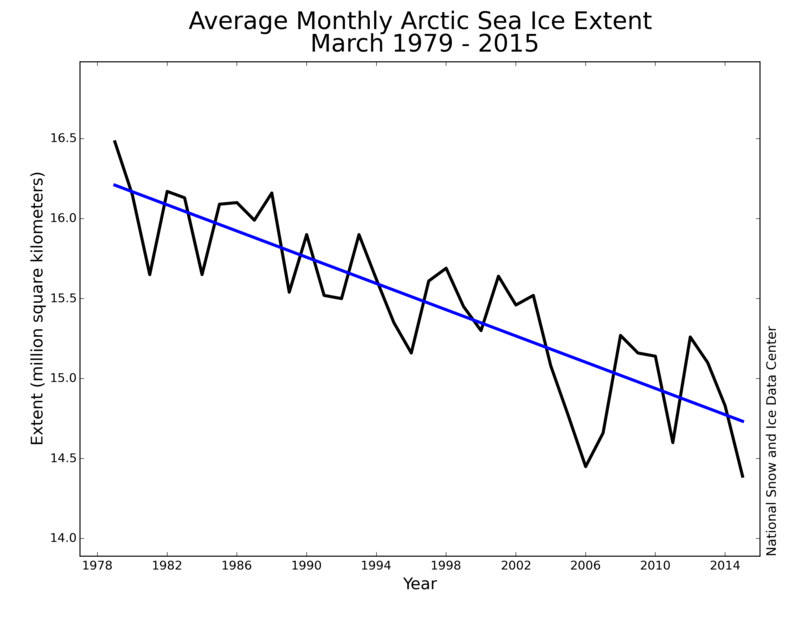 Now it is too early to tell where we will be when we reach this years sea ice extent minimum. There is a fair amount of natural variability, and day to day weather seems to be having a greater effect on the minima nowadays. But we shouldn’t be surprised if there is a regression to the trend, or for that matter, if minimum sea ice extent and sea ice volume actually shoot below the trend. The chart itself is from PIOMAS modeling. However, the arrow pointing to “prediction” has been added, as has been the circle “reality”. But whose prediction? The chart shows how an exponential trend has an especially good fit, at least going up to the 2011 minimum. However, drawing an exponential trend based off of the data is not the same thing as making a prediction. Regarding the circle… I see that it’s center is just a little below 8,000 cubic km. Now this can’t be the current value since 90 days into this year PIOMAS had us pegged at 24,036 cubic km. And it can’t be the 2014 minima since PIOMAS gives us 6,812. So where is this volume that’s been labeled “reality” coming from? As for when we will first see a sea ice free Arctic, mainstream opinion among the experts has been that we will see our first sea ice free Arctic some time after 2030. Maslowski is a notable exception who, in 2009, based on a constant rate of volume of sea ice loss, argued that if current trends held we would see our first effectively sea-ice free Arctic in 2016, +/- 3 years, but he is an outlier. The correct value should have been about 7 km^3, as it should have been the september minimum, not the october value. The green arrow is an “arm-waving” gesture of the upward trend, present in the last few years. If you can point me to the numerical PIOMAS data, instead of the graphic, I’ll be glad to calculate the RMS linear regression to calibrate that arm-waving. Post a URL. Regarding the circle… So where is this volume that’s been labeled “reality” coming from? The chart you are adding that circle to is of the “Annual Minimum Arctic Sea Ice Volume.” The title of the chart says so. You might as well be adding a March maximum. It is like arguing that global warming has ended because summer was really hot and now you are in the depths of winter. I modified that chart (which comes from AlGore’s prediction). Al Gore generally doesn’t make predictions, not with respect to the climate, anyway. He isn’t a climate scientist. Given the amount of natural variability in the system, what in statistics might be refered to as noise, someone who honestly wants to analyze what is happening to the trend in either sea ice extent or volume will pick a longer period. Probably in the neighborhood of at least ten years. This is what Maslowski did, and it seemed justified at the time, given the amount of natural variability we had seen in the system in previous years. However, as sea ice declines, the amount of natural variability in the system appears to be increasing. The system is becoming more sensitive to weather. As such ten years may not be enough to estimate the trend. However, as I indicated earlier, if we estimate the trend and natural variability based off of 1978 to present, we find that the current trend in modeled volume is just outside of one standard deviation from the mean, and assuming a normal distribution, it should be outside of one standard deviation 32% of the time. As such, given the performance of the model, it would seem there is little justification for claiming that its behavior has deviated from the long-term linear trend. If you can point me to the numerical PIOMAS data, instead of the graphic, I’ll be glad to calculate the RMS linear regression to calibrate that arm-waving. However, if you use it in the way that you suggest, calculating a very short-term trend for a three year period, you will be doing so with far less justification than Maslowski’s 10-year trend when it wasn’t at all clear that the natural variability in system had greatly increased. The alternative (to the short-term, arm-waving trend) is to Give in and join the woe-is-me “warmers” who say this is the end of the world and I won’t do that. A trend is, well, a trend… you can argue that it is “too short”. I’m not going to. Not really. If you are trying to estimate the a linear trend then you should insure that your analysis is relatively robust, independent of the starting point. 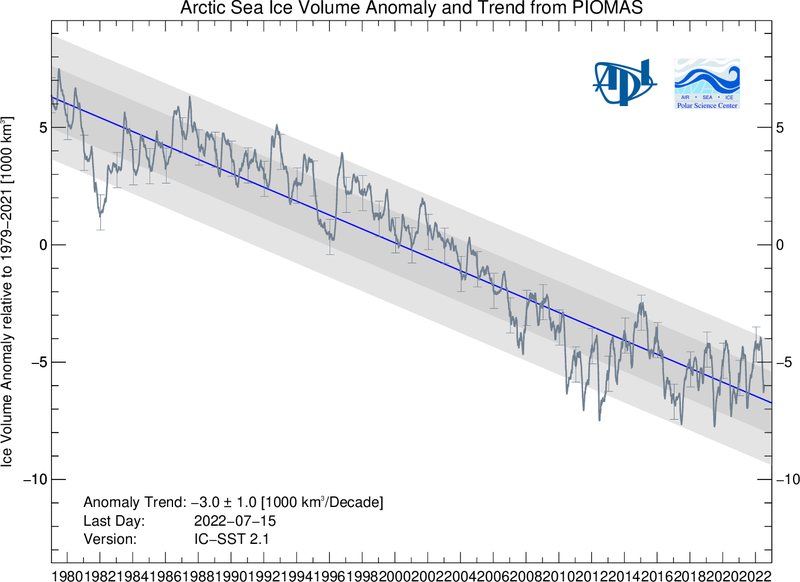 That is the argument I made with respect to PIOMAS sea ice volume. If you construct a linear trend over a sufficiently long period and calculate two standard deviations from that trend, with the dark grey representing one standard deviation and the light grey being two standard deviations, for an apparent change in trend to be regarded as statistically significant it must lie outside of two standard deviations of the original trend. Looking at the chart you had used it the upward swing had placed us just outside of one standard deviation from the trend, and assuming a normal distribution this should happen 32% of the time. However, things have changed since the time that someone grabbed the chart from the PIOMAS website. The modeled volume anomaly rose to nearly 1.5X the standard deviation from the linear trendline. I have included the updated chart as my first chart below, but came from http://psc.apl.uw.edu/research/projects/arctic-sea-ice-volume-anomaly/ . Given a normal distribution, there would be only a 5% chance (or “p-value”) that at any given time the anomaly would be more than 2X the standard deviation from the trendline. This is what is normally regarded as statistically significant. If you haven’t reached “two-sigma” typically your evidence isn’t seriously considered evidence of anything. But at 1.5X the chances are 13%. However, even if it were to exceed 2X this wouldn’t necessarily mean that the trend has actually changed. After all, what happens 5% of the time will happen sometimes. However, if you are a bit more sophisticated than myself, you might try something called change point analysis. It is the proper statistical technique for subdividing a time series into sections with different linear trends. Rather than hand-picking some intervals to look at, like I did above, this algorithm objectively looks for times in the data where the trend changes in a significant way. It will scan through the data and try out every combination of years to check whether you can improve the fit with the data by putting change points there. The optimal solution found for the global temperature data is 3 change points, approximately in the years 1912, 1940 and 1970. … and they provide a link to a website http://www.changepoint.info/introduction.html that describes the method in greater detail. I have included the chart for change point analysis provided by Real Climate as my second chart below. There is another approach, one explored by a professional statistician who on the internet goes by the handle “Tamino”, one which seems particularly relevant to your nailing down the end of your range for calculating the trend with “now” but regarding the selection of starting point as arbitrary. (He presents it at https://tamino.wordpress.com/2014/12/09/is-earths-temperature-about-to-soar/ .) What he asks is whether given a later starting point (some time after 1970) we are justified in rejecting the null hypothesis that the rate of warming has changed from what it was prior to that later starting point. Only if we can contradict that null hypothesis can we say there’s valid evidence of a slowdown. Then he calculates the p-value using as a starting point each year from 1990 to 2008 with the end point being the last complete year of 2014. Furthermore, performs the same analysis for GISS, NOAA, HadCRUT, Cowtan and Way, CRUTEM4, Berkely, UAH TLT and RSS TLT — just to show that his results are robust to the choice of temperature index. The result? For all indices there is no starting point between 1990 and 2008 that one may pick where a deviation in trend from the original linear trendline rises to the level of statistical significance. I have included the chart showing the results of Tamino’s calculations as the third chart below. Did I give you any links to WattsUpWiththat.com? I don’t even click on “skepticalscience” links. Make your own point, and cite journal-published, peer reviewed scientific literature. I actually like that cartoon. Nope. I didn’t edit the old comment. Disqus does not allow modification of graphics, once posted. Can’t delete a graphic, can’t add a graphic. One can delete the entire comment, but half the time, the old comment remains, but the “from” is changed to “guest” … Perhaps you just clicked on the “more” to see the graphic “below the fold”? Do you know that, if the extent is reduced (as the article claims) yet the volume is larger, that something changed? Hint: thickness must increase, if extent is reduced and volume is the same, or larger. You can’t get thickness by dividing volume by extent. First, while average thickness is volume divided by area, sea ice extent isn’t the same thing as sea ice area. Sea ice extent is the sum of the area of cells above a certain concentration threshold where concentration is measured in terms of area covered for each cell. In this context, cells are non-overlapping rectangular regions of the same uniform dimensions which jointly cover a given area. With the NSIDC the cells are 25 km by 25 km. The concentration threshold is 15%. In fact, it is possible for extent to to decrease while area increases if the concentration in what cells are included in extent increases. Second, the chart for modeled volume anomaly is just that: anomaly, not volume. It is deviation from the average, the average volume minus the current volume. A further complication is that climatologists will not necessarily use in their calculations the average over an entire period but the average for the same month over the entire period, comparing the current January with the average January. This removes the “annual cycle” so that it is easier to see the trend. In the case of the PIOMAS modeled volume anomaly it looks like they haven’t tried to remove the annual cycle, but I honestly don’t know. “Do you know what PIOMAS stands for? Hint: “M” stands for “model”.” I hate models. Can you post any other metric for volume of Arctic sea-ice, updated monthly? PIOMAS postings are the only game in town, as far as I know. Go ahead, post something better than PIOMAS. Can you post any other metric for volume of Arctic sea-ice, updated monthly? Open Access: Laxon, Seymour W., et al. “CryoSat‐2 estimates of Arctic sea ice thickness and volume.” Geophysical Research Letters 40.4 (2013): 732-737. It is measuring both volume and thickness. They go into PIOMAS in some depth, comparing their radar altimetry results against its results. According the CryoSat-2, an early version of PIOMAS’ algorithm appears to have overestimated the ice loss in some areas. PIOMAS has since modified its algorithm, showing less ice loss. However, even assuming CryoSat-2 is estimating monthly thickness and volume, the data can’t go back any earlier than April of 2010. The satellite was launched on the 10th of that month. IceSat (2003-9) focused on ice sheets, and does not appear to have been sensitive enough for sea ice. IceBridge (2009-16) is limited by coverage due to the altitude from which measurements are taken. Cryosat reports that Arctic sea-ice is thickerer. The same would hold for a few years at least for winter sea ice thickness. Days or years do little to affect the long term trend. “We’ve already found that, although Arctic sea ice set a record this year for its lowest ever winter extent, it was about 25 cm thicker, on average, than in 2013, when CryoSat recorded its lowest winter volume,” explained CPOM researcher Rachel Tilling. This brings up two points. First, 2015 saw the lowest ever winter extent. This being the case, there would have been less of the thin first year ice than in other years. If so, the ice that would have been left would likely have been the thicker multi year ice, bringing up the average thickness. Second, record low volume (and thickness) were set back in 2013. In a quasistationary world we speak of regression toward the mean. In a nonstationary world it is appropriate to speak of regression toward the trend. It is not at all surprising that one or two years after a new record minima we might see ice increase in thickness or volume, particularly if a great deal of fresh water is being dumped into the ocean by Greenland, resulting in the slowing of the Atlantic Meridional Overturning Circulation (AMOC). Fresh water has a higher melting point than saltier water. Additionally, more fresh water means greater ocean stratification, reducing heat exchange with the warmer water below. Greenland has been losing a great deal of mass within the past decade. … the source of the first image below. Because the AMOC is driven by density gradients related to deep-water formation in the high-latitude North Atlantic, a weakening of the AMOC could be caused by a regional reduction in surface ocean density. Ref. 29 describes an ongoing freshening trend in the northern Atlantic in which the net freshwater storage increased by 19,000km3 between 1961 and 1995, and the rapid AMOC drop in 1970 was preceded by a large-scale freshening known as the Great Salinity Anomaly. Additional sources of freshwater addition are increasing river discharge into the Arctic Ocean32 and meltwater and iceberg discharge from the Greenland Ice Sheet (GIS). Because surface flow is directed northward and freshwater tends to remain near the surface owing to its low density, it is difficult to remove freshwater from the northern Atlantic, so an accumulation over longer timescales is plausible…. Perhaps as a consequence of the cooling in the Greenland region starting in 1970, the GIS subsequently was closer to mass balance for three decades until AD ∼2000(ref.33). Since then the GIS has started to lose mass again at a rapidly increasing rate, consistent with the surface warming of the region which has been attributed to a recovery of the AMOC based on model simulations initialized with observations38. Paywalled: Rahmstorf, Stefan, et al. “Exceptional twentieth-century slowdown in Atlantic Ocean overturning circulation.” Nature Climate Change (2015). … which is the source of the second image below. But winter or spring sea ice thickness or extent aren’t what we are most concerned with here. People typically focus on the Arctic sea ice extent, area and volume minima set in the fall. But climatologically the minima isn’t what is most important. In terms of the amplifying positive feedback, what matters most is the reduction in sea ice area while the sun is still high in the sky, during the summer. As such, a seasonally sea ice free Arctic in itself isn’t as grave a concern as it is sometimes made out to be, but the more sea ice is reduced during the high sun of the Arctic summer, the more it will tend to amplify the warming due to our carbon emissions. While the change in saltiness is too small to significantly affect the freezing temperature, the increase in slightly less dense water surrounding Antarctica inhibits mixing, creating conditions that favor ice growth (as we discussed in our July 17 post). This point that “slightly less dense water… inhibits mixing” is something I cite in the sentence that comes immediately after the sentence from my comment you chose to respond to. Fresh water has a higher melting point than saltier water. Additionally, more fresh water means greater ocean stratification, reducing heat exchange with the warmer water below. It is also worth keeping in mind that the article you chose to quote from is speaking of Antarctica, not the Arctic. Now it may be the case that the higher freezing temperature of fresh water coming off of Greenland does not play a significant role. But even if we assume it is, fresher water is less dense water and will therefore lead to greater ocean stratification, reducing the transfer of heat from the warmer, saltier water below, favoring the creation of more ice. This is a point both I and the article you cite make. The liberal view – day after day, month after months the Arctic ice is melting. Irreversible, accelerating, past the point of no return. The Northwest Passage is still frozen solid! And will be through the summer. What are you talking about? The northwest passage has been open several years now. That’s the same idiotic reasoning that saw the ill fated cruise ship full of true believers get stuck in the Antarctic, and took the navies of three nations to rescue them. That was quite a carbon footprint. All done with fossil fuels, of course. There’s even a name for that sort of thing now. Still a straw man argument. Northwest passage is often open. They are planning an extreme yacht race through it. You sir/madam are a science denier. ” Climate change has made this sailing race possible”, they say. Remember P.T Barnum? He was right! And don’t forget the guy who said, “A fool and his money are soon parted”. So, you are wrong about the Arctic ice and the northwest passage. And climate change is happening here and now – we humans are causing it, this time. Feel free to believe what you want to believe. It will take more than “belief” to open the Northwest passage by 2017 for a sail boat race. The publicity stunt may impress low info voters, I grant you. One doesn’t “believe” in science. Look up the data – the northwest passage has been open several years recently. We are talking about last summer and this summer, as I recall. Yes, but that is the only time we know about. And it is not for a lack of trying. A little earlier there was a ship that tried, and it remained frozen in the for almost 3 years. Now it is happening fairly regularly, and will likely happen every year in the near future. Anthropogenic climate change is happening here and now. As science tells us. There you go again, devining the future. Need a licence for that? Or just an E-bay crystal ball. I can see why Mike gave you the thumbs up. He’s thinks he is good at fortune telling too. But, we live in THIS world, and the forecasts from the warmistas have unilaterally failed! The trend is strongly going for less and less ice. That much is clear. But the exact time is not knowable. That’s why only idiotic liberal warmistas would plan such a costly date certain event as a 2017 STAR ARCTIC RACE on such a flimsy weather forecast. On a more serious note, we can only hope that the money wasted on such foolishness will come out of their own naive pockets, and not be subsidized in someway by the taxpayer through their liberal politicians. It’s those liberal facts intruding on your fantasy world again? Here’s a clue for you: weather and climate are quite different. The long term trends are climate, and the specific day-to-day events are weather. When you conflate weather predictions with climate trends, you reveal your lack of understanding. I gave him the thumbs up because he’s been stating simple fact, and remaining much more respectful than you have been of him, which I can entirely relate to. It get’s pretty difficult at times. “Warmistas?” Really? Be good, Wilson. Generally without spending a couple of years iced in, as Amundsen had to, or having to traverse routes only 3 feet deep. So ice still freezes in winter. Spring’s just arrived, and there’s a good chance of an open Northwest Passage this summer. Is this where you’ve moved the goal post now? Will you accept there’s warming only when the passage is open every summer? Or both summer and winter? When all the ice is completely gone? The article you linked to pointed out that this March’s average ice cover was a record setting low. And that’s not a liberal interpretation, it’s fact based on the satellite data you’ve kept pointing to. Good day to you, sir. I will accept the warming, when any of the multiple failed predictions below, actually occur in real life. (I’ll just add your own, ” there’s a good chance of an open Northwest Passage this summer” to the following, LOL). “open year round before the end of the twentieth century”. Really? You’re dredging up predictions made 40 or 50 years ago, and statements from politicians, who aren’t typically the most scientifically literate folks in either party? But if you want to play guilt by association with Al Gore and John Kerry, I guess I could always post the near daily idiocy of Ted Cruz, James Inhofe, and numerous other Republicans who’ve demonstrated their own scientific ignorance, despite being placed in positions to influence science policy in America. Or why stop there — you’re conservative, so why not just generalize the way you do about liberals, and hold you accountable for the lunatic ravings of Glen Beck, Ann Coulter, or Michael Savage (Weiner). I could, but I won’t stoop to that level. You’ve provided no hard data to refute the well-established fact that the planet’s average temperature has risen due to the effects of greenhouse gases, and argue even as those effects become more apparent in the arctic and in the American West. You keep referring to a “scam,” but the only one being scammed is you, Wilson, by your own ideologically imposed blindness. You certainly aren’t winning over anyone here, but perhaps it’s therapeutic for you to vent. I hope you’re at least getting that from your posts. Good health to you, Wilson. This gets a little weird with you warmers. I only post facts (from NSIDC, NASA) and statements actually made by your own side of the debate (politicians, and U.N. Officials who are leaders of your Global Warming brave new world order) and you reject them out of hand. These are not MY statements, opinions or data, but from YOUR side of the debate. You even make my point that predictions by warmers are invalid “40 or 50” years out. Stick to photos of sad polar bear cubs. Your low info voters ate that up. I still see the pictures in classrooms. That worked for your far more than your feeble attempts at cherry picked science. OK, I’ll spell it out to you in words you can understand. Winter is cold. Summer is warm. When it’s cold you get more ice. But a winter can be less cold than the last, or a summer more warm, and if this goes on, it becomes a trend, and it leads to less ice as the years pass. Which is what we see both in March (when there’s the most ice, at the end of the cold period http://nsidc.org/arcticseaicenews/files/2015/04/monthly_ice_NH_03.png) and September (when there’s the least ice http://nsidc.org/arcticseaicenews/files/2014/10/monthly_ice_NH_09.png). As the years pass, we see less and less ice. And the only person I’ve seen cherrypicking in this discussion is you – as in cherrypicking the most pessimistic worst case scenario predictions ever made, while missing the elephant in the room, which is that the overall prediction of less ice per year has held up very well indeed. You’ve no idea what goes on up there. First off, there is (naturally) so much heat in the deep (saline) arctic waters, all the time, that, if it were to surface, would show the same amount of detriment to the sea ice. In fact, that is how it happened. Shimada, Koji, et al. “Halocline structure in the Canada Basin of the Arctic Ocean.” Geophysical Research Letters 32.3 (2005). Parkinson, Claire L., and Josefino C. Comiso. “On the 2012 record low Arctic sea ice cover: Combined impact of preconditioning and an August storm.” Geophysical Research Letters 40.7 (2013): 1356-1361. Screen, James A., Ian Simmonds, and Kevin Keay. “Dramatic interannual changes of perennial Arctic sea ice linked to abnormal summer storm activity.” Journal of Geophysical Research: Atmospheres (1984–2012) 116.D15 (2011). Simmonds, Ian, and Kevin Keay. “Extraordinary September Arctic sea ice reductions and their relationships with storm behavior over 1979–2008.” Geophysical Research Letters 36.19 (2009). In September, 2009, mechanical fracture affected Arctic sea ice. Asplin, Matthew G., et al. “Implications of fractured Arctic perennial ice cover on thermodynamic and dynamic sea ice processes.” Journal of Geophysical Research: Oceans 119.4 (2014): 2327-2343. Busted up ice exposes more ice to the wave action, which busts up more ice. Rudeva, Irina, and Ian Simmonds. “Great Arctic Cyclone of August 2012 and associated sea ice anomaly.” EGU General Assembly Conference Abstracts. Vol. 15. 2013. Miles, Martin W., et al. “A signal of persistent Atlantic multidecadal variability in Arctic sea ice.” Geophysical Research Letters 41.2 (2014): 463-469. Really? in only six months? We went from 13.7% loss per decade to only 2.6%? per decade sine 1979? And, of course, the last time I checked, we had TWO poles. Now I think you might be just trolling me. Look at what those percentages mean in absolute terms, and it’s a net loss of about 2 million square km at the peak portion of the year (out of 16 million square km) vs a net loss of 3 million square km (out of 8 million square km) at the trough portion of the year. The two are slightly divergent, but the key difference is that they have very different denominators. Oh I see, you have an explanation! But in the real world, the Arctic has not lost ice cover in the last 10 years? How do you finagle that? You can’t see the loss by date from that graph because it doesn’t spell out exact dates, only trends over a year, although surely you can see as I can that the average anomaly is greater in 2014-15 than 2004-05. You can, however, get the exact figures by date from the NSIDC’s charctic tool, and here, certainly you can see that for this specific day, 2015 is indeed tied with 2005 for extent. But there’s a lot of noise in the way of variability by specific days; look at the overall lines for 2014 and 2015 and compare them with 2004 and 2005, and you’ll see which tend to be lower. So no change in Arctic ice cover in the exact last 10 years, according to NSIDC. And of course, Global sea ice is above the mean for the satellite record, according to the same NSIDC. You’re being massively selective in favour of data to prove your initial position, picking high points on a very variable distribution, while ignoring the average trend of said distribution. Take global sea ice area – only in recent years, e.g. 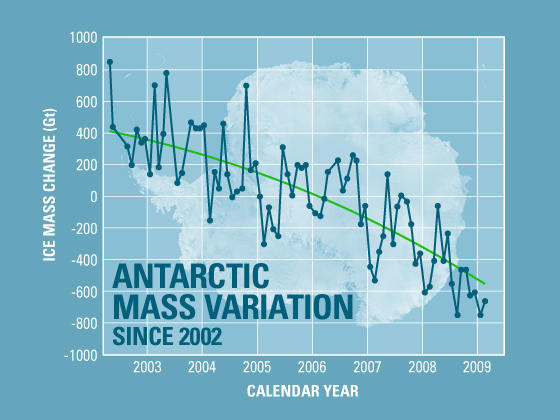 2006-2007, or 2011-2013, has it dropped well below the average line that it normally hovers around http://arctic.atmos.uiuc.edu/cryosphere/IMAGES/global.daily.ice.area.withtrend.jpg. 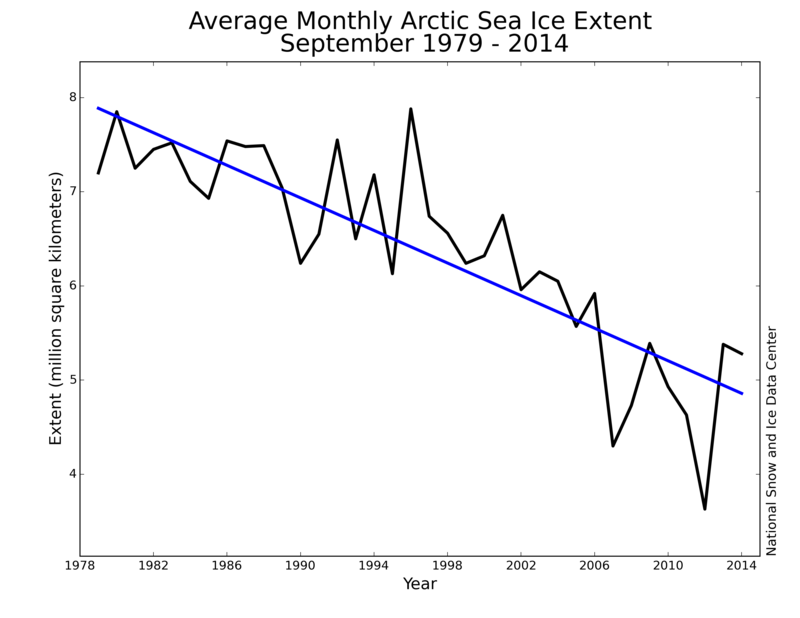 Or take the downwards trend shown in arctic sea ice data, year on year. Or any of the land ice data that you’ve been completely ignoring. (All linked previously). The only reason you’d want to take single day snapshots to look at as your major data source would be to deliberately skew the results. Anyway, I’m off and away for the next few weeks, and am done with this chat. But please look at the data with an open mind – it should be used to enlighten, not support. Global ice is above the average (mean) over the ENTIRE period. You are arguing (squirming) about 2006-2007 and 2011-2013. which show Global ice below the average (mean) for those years. If you mean by that what I think you mean, you’re talking about a statistical impossibility. Ice cannot be above the mean for a period over all of said period. Let me re-phrase it to make it clearer for you. I was wondering when this bit of whatabouterry would make it into this discussion on the NW Passage… but hey, I’ll indulge you. Please stick to accepted scientific organization data, say NASA, or NSIDC. And they should be able to tell us even more after their next icesat mission launches in 2017. Go sell it to your low info pals! And “low info”? I’ve been putting all the information into this debate of ours, while you make spurious claim after spurious claim, simply making new ones up each time I show you that the data doesn’t support the statements you’re making. How about you bring some info to this chat? It isn’t that simple. The cold, fresher water lies above the warmer, but saltier water below. Even if it is colder in air temperature, a disturbance to the layering of waters can cause ice to melt more rapidly. Conversely, a warmer air temperature, with intact layering, can isolate the warmer waters below, and cause ice increase, even though the air temperature is relatively warmer. Steele, Michael, and Timothy Boyd. “Retreat of the cold halocline layer in the Arctic Ocean.” Journal of Geophysical Research: Oceans (1978–2012) 103.C5 (1998): 10419-10435. “When it’s cold you get more ice.” … ” and if this goes on, it becomes a trend, …” Lots of cooling trends, documented in the Arctic. When it is colder (documented below) … do we get more ice? Those graphs aren’t even trying to produce trend lines, they’re just cherry picking peaks and drawing lines from them. The graphing software at data.giss dot gov doesn’t produce a trend. The graphing software at NCDC.NOAA dot gov does. deebles, you could communicate better, by telling us what is in the URL that you are offering us, to click. I live out in the country, and I have a sloooooow internet. I don’t click on things (most of the time) so whatever point you are trying to make it is lost. So, tell us some tantalizing detail of what is in that URL and give us a reason to click it…. Your confirmation bias is lying to you if that’s what you take away from the graph. If you choose to measure from a peak, of course you’ll skew the data. Pick a temperature time-series chart, and I’ll send you the data, complete with the RMS Linear Regression Analysis… and, I’ll show you how to do it yourself, using easy web sites…. What does ‘liberal’ have to do with anything. Facts are facts, whether you’re a fascist, communist or even US republican [laughing stock of the world]. It’s not a political issue. Its a scientific one. Is smoking causing cancer a political issue? Oh yes, I forgot. In the US, you don’t have democracy, your corporates run your government, and damn the truth if it doesn’t make them money. In the U.S. the Corporations answer to the public. In the U.S. the public answers to the government! Your corporates own your Govt. They buy your senators, fund your presidential campaigns, and set govt policy by way of their lobbies and tame senators. And they fund misinformation campaigns to dupe your public, who tend to be very unaware of the wider world anyway. Can’t really disagree with you there! They’ve been relatively successful selling the Global Warming scam to low info voters. They’ve been relatively successful selling the anti-Global Warming scam to low info conservative voters. Not at all, all scientists agree with your side. It astonishes me how things are getting worse and worse yet very few people actually do anything about it. Our leaders spend too much time worrying about where to get more resources when we have already depleted the others, and too little time trying to fix the damage we’ve already done. Gallup took a poll … “Global Warming” = dead last. The majority of Americans don’t think Mannkind is responsible. For those that think Mannkind is responsible, the above surveys show that it isn’t a high priority … in fact, of the choices offered, it comes in dead last. When it comes to “the environment” … less and less, over time. And this pleases you? Sad. Really sad. Ah, liberal schools and low info voters! A lot to be said for home schooling. Most of us federal workers put a great deal of ourselves into our work, and believe in serving the public as something that aligns with our values and gives us a sense of fulfilment. Your comment, on the other hand, is the kind of over-generalization that really reflects a low info kind of post. Try to be a little more thoughtful, Wilson. Your posts reflect poorly on you, and that could easily be rectified by thinking a little more before typing. Good evening, sir. In reality government (as in the IRS) blame the GOP for not providing the money (10 million) needed to bring the Department into line with my small company that archives all of it’s email, at low cost. While at the same time giving $90,000,000.00 in bonus’s. You and your “government” are just an expensive joke, that perpetuates the VA, State Department, Justice Department, IRS, Secret Service scandals. Well, I guess it would have been too much to expect an apology for yet another over-generalization slurring an entire group of folks for the bad behavior of a well-publicized few. What if I were to say that all businessmen are crooks, and that you got what you deserved? That, too, would be a stupid overgeneralization, which is why I avoid such sweeping statements. I’m sorry if you had trouble with the IRS (which I don’t work for by the way), but that agency too has hardworking and conscientious employees, trying to deal with the system as it currently exists — which is a hodge-podge of regulations passed by members of both parties over the years, judicial rulings, and executive actions. Most of us do approach our work hoping to be as helpful to the tax-paying public as we can. So try to be a little more selective with your ire. It doesn’t make for a good argument when you sweep up a whole group based on your bad personal experience with a few, or the well-publicized accounts of outrageous malfeasance in certain cases, when you hardly ever see the press reporting on the vast majority of public servants who never abuse the public trust. No hard feelings, but try to be a little more considerate, selective, and well-informed in the future. Be well, Wilson. You have no problem stereotyping corporations as “corrupt”, but in actual fact they are more responsive and accountable to the consumer, than is government. What used to be our “civil servants” are now our lords and masters, deciding what we can eat, drink, say, earn, keep, treat our illnesses, teach our children, and now even breathe. Already they are salivating at the prospect of “regulating” the internet, so that voices of dissent can be further silenced. What you naïve liberal folks never understand, is that while you are cheering a government that does what YOU want it to do, you are also giving them the ultimate power at some other time, to do exactly the opposite. A future Lois Lerner could just as easily target blacks. Hispanics, gays, and yes, Global Warmistas. Yesterday, gays, blacks and Hispanics. All the same to totalitarians. Alright, now this is just outlandish. Comments like this are the ones that have people either wondering if you’re pulling a Colbert or losing your grip on sanity. You’re seriously comparing the “plight” of poor conservatives, Republicans, and Tea Party folks with what the groups you listed went through in the past, and to some extent, even today? I might have missed it in the news, but when did 6 million conservatives face genocide? Republicans today face lynching, rampant discrimination, laws forbidding them from mixing with other folks or even voting? Economic exploitation and laws specifically targeting them as a group? Getting hassled by the IRS is wrong, but it doesn’t put you anywhere near the category of the groups you aspire to join in victimhood. And if you think there’s totalitarianism in the present United States, you’ve lost all sense of perspective. If you want to be taken seriously, Wilson, you’ve got to drop this ridiculous hyperbole. You can make some good points, but posts like this really hurt your credibility. Try to look at some of the things you say from a more objective view, and you’ll see what I mean. I hope you think of that the next time you post. Anyway, good evening to you. I’m just saying that discrimination of any sort should not be allowed to stand. He exhorted Latinos to “punish their enemies”, and that includes half the country that don’t agree with his policies. That’s the talk of a street organizer, not the leader of a country. Reid: Tea Party Republicans Are “Anarchists” Taking The Country Hostage. Nope, you’re the king of stereotypes and broad overgeneralizations, as I pointed out and tried to talk you out of in my last post. Not surprisingly, a futile gesture. I’ve never stereotyped all corporations as corrupt, but you have no problem lumping me and all other government workers in with your “lords and masters” comment. A shame you can’t see people as individuals, rather than stereotypes to rail against. Try to do better, please. Trouble is we have deal with reality. Which is that the Earth does not “provide” us with the necessities of survival. Life forms have struggled to survive a molten earth, a snowball earth, massive volcanism, catastrophic sea level rise as new oceans form and retreat. Most of the species that have ever existed struggled on this planet have been wiped out. There is no “Mother Nature’. You can hug a tree all you want, but you have a good chance of being killed by flood, earthquake, volcano, tornado, drought, landslide, avalanche, asteroid, bad genes, deadly disease, or even one of your fuzzy warm polar bears. Life is always a struggle. Unfortunately, this spoiled and protected Iphone Kardashian generation, who think food comes from the family fridge, have never been in touch with real life, and figure there’s an app for climate, or should be. They enjoy homes with piped water, electricity, cable, natural gas, oil, petroleum for their cars, cellular phones all which require land for dams, pipelines, transmission corridors etc., but are stupidly and selfishly against these things in principle for others. To build a major dam, pipeline or Interstate highway system would be virtually impossible today. The spirit and the energy that built America is now derided by more than half the population. Once a population collectively forget the sacrifices that were made by their forebears to give them freedom and prosperity, well, just look at history! The problem with you would be do gooders, is that you project your own selfish attitudes, guilt, onto others, and then come up with a cure that you would force on them. In the old days, Al Capone ran the drugs, gambling, liquor, loan sharking, numbers and prostitution rackets. Today it’s your government who rakes in the profits. You work for them, so naturally you are protected for life, and if you are found out to be lying for them you’ll be well rewarded and may even get a promotion once the collective memory of the low info voter has passed (currently about 6 months, if the Hillary obscenity is anything to go by).